In the Boston Globe Magazine, Peter DeMarco examines whether plans for new bike paths and bridges will be enough to convince more than half of us to ditch our cars and become two-wheeled enthusiasts. These significant off-street bikeways  existing, planned,and wished for  would create a much-needed backbone for Greater Bostons cycling network. Scroll below the map for details on what the numbers and colors depict. This map shows only major shared-use thoroughfares into Boston on dedicated trails, excluding most on-street bike lanes. 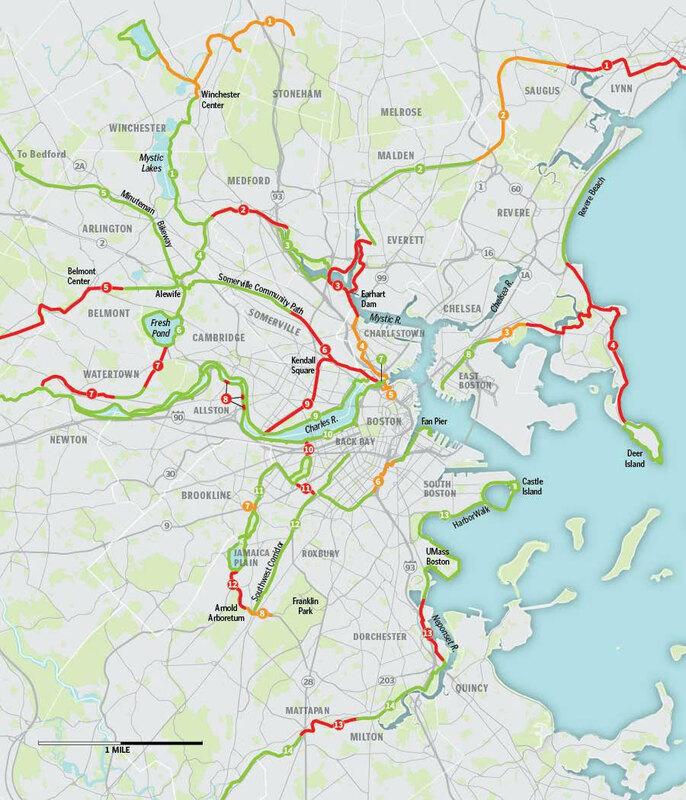 It was compiled with help from cycling experts from the Metropolitan Area Planning Council, MassBike, the Department of Conservation and Recreation, The Boston Cyclists Union, The Charles River Conservancy, Northeastern Universitys College of Engineering, and Boston and Cambridge planning and transportation officials. *Small portions of these are built or planned for.